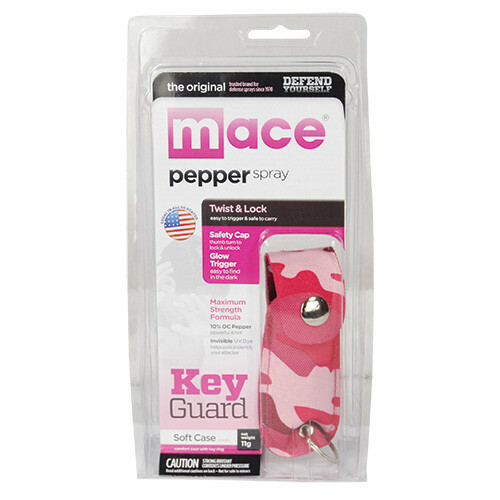 Mace KeyGuard Pepper Spray, Soft Nylon Case Pink Camo model. These pepper sprays contain oleoresin capsicum – a naturally occurring substance derived from cayenne peppers that creates an intense burning sensation to the skin, eyes and throat, and causes an attacker’s eyes to slam shut upon direct contact. This formula also contains an invisible UV dye, which marks the assailant and may aid in identification. The soft nylon case is great if you are on-the-go. The pepper spray comes in a nylon pouch that has a snap closure and key ring, so it’s convenient to carry. The glow in the dark locking safety cap makes it easy to use at night! 10% Pepper Spray Stream, Weight 11 grams, Dimensions 4.5" x 1.5" x 1.5", 10' range, 5 Bursts.